Rearing of silk worms - sericulture - is a complex process conducted by small communities in particular parts of Laos, timed around the rice harvest. Traditional Laos silk produces short yellow strands that can only be reeled by hand. 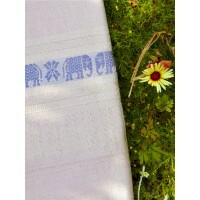 This results in a soft silk with a linen-like texture, which absorbs dye well, creating rich colours. Due to these desirable qualities and small-scale silk production, Laos silk is more expensive than from neighbouring China, Vietnam or Thailand. A new generation of weavers and social entrepreneurs are evolving Laos' textile tradition, many based in Luang Prabang, the historic centre of Buddhist practice and learning - and a mecca for tourists. Committed to keeping alive the slow-but-sure processes of Laos silk production, natural dyeing and handweaving, these artisans and businesswomen - and it is mostly women - represent an alternative to the machine-made imports from neighbouring countries, which flood the night markets of South East Asia. A tight, fine plain weave with supplementary weft. 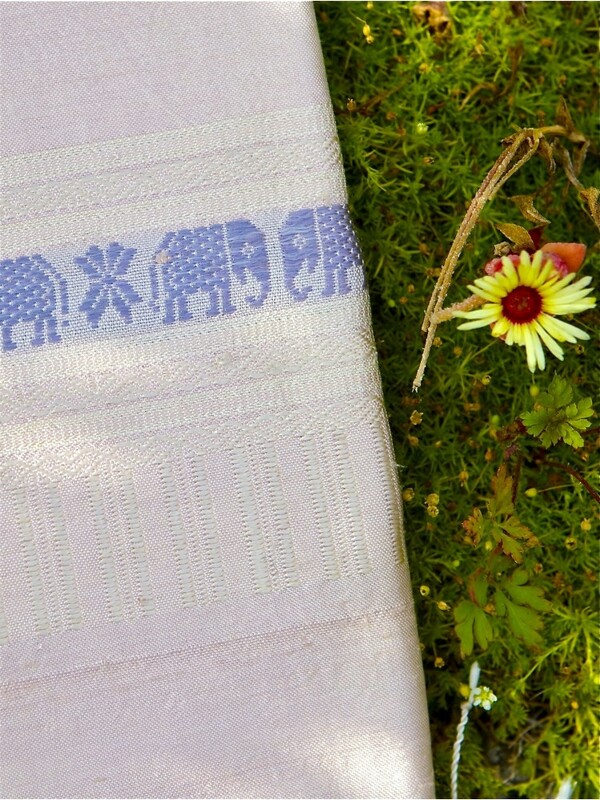 Extra or supplementary weft threads are introduced to create the decorative elements of Guanyin scarves - tiny elephants, rippling raindrops and delicate stripes. 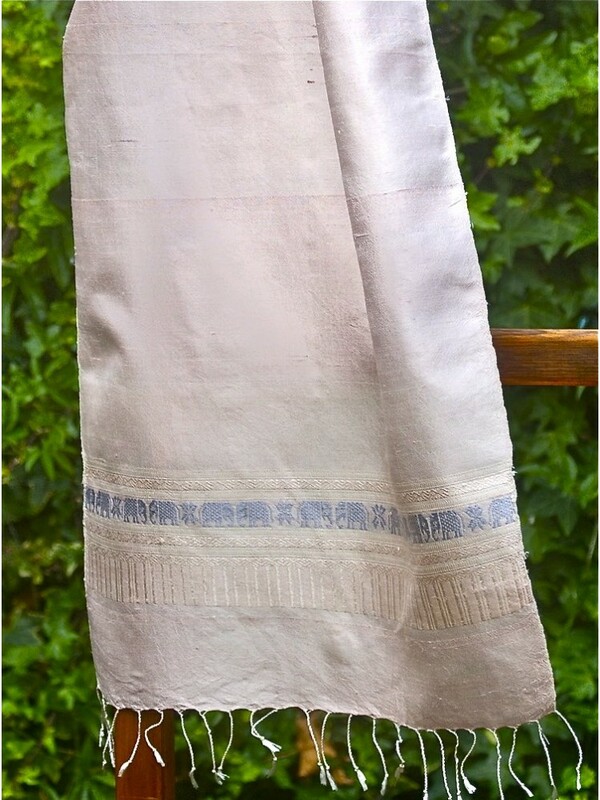 Any slubs or colour gradations are unique characteristics of Laos' high-quality handspun, natural dyed and handwoven textiles. 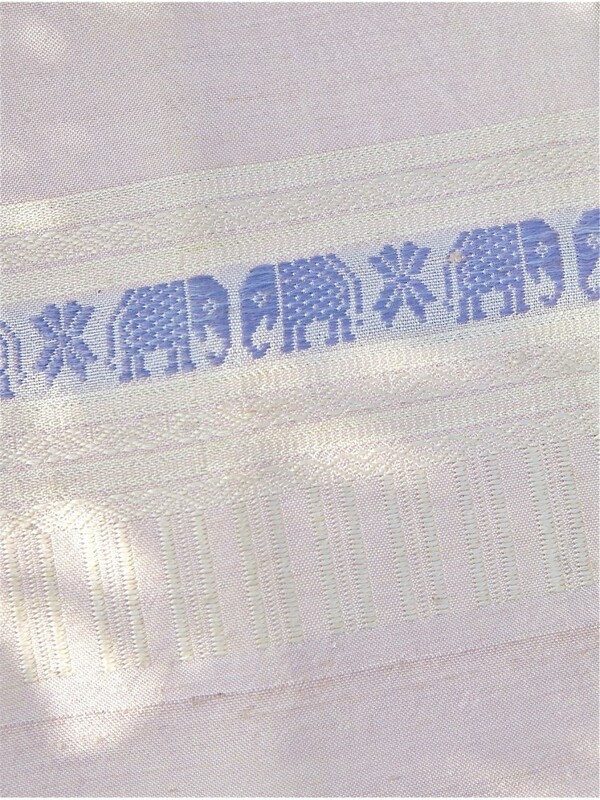 Faint pink, a cool, luminous shade - enitrely un-sweet - discreetly traversed by pale blue elephants.